If you are tired of having your carpet cleaned and then having to wait hours or even days to walk on it again, don’t fret; Heaven’s Best offers low-moisture carpet cleaning in Birmingham, AL that will dry in 1 hour. 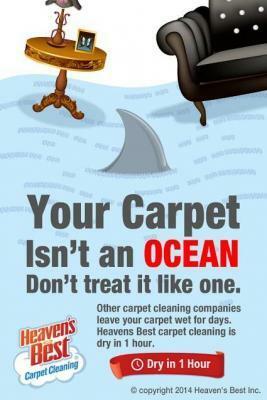 Your carpet isn’t an ocean! Don’t treat it like one. Many carpet cleaning companies over-wet your carpets and will leave it wet for hours or even days. Heaven’s Best Carpet Cleaning does not do this. We use a low-moisture process that uses less water so your carpet is not left wet for hours or days. It will dry in about 1 hour! This does not mean your carpet isn’t clean when we finish. We use professional strength cleaning solutions that will thoroughly clean your carpet. Our cleaning products work very well on just about any type of spots or stains you may have. As well as being strong cleaners, they are also environmentally safe. So, you won’t have to worry about your children or pets playing on the carpets soon after they are cleaned. We also do not charge extra for deodorizer like some other companies. We include deodorizer in all our cleanings. You can choose for either Citrus or Cherry Almond. Most customers choose Citrus as it gives a clean, fresh scent and it will make your entire house smell great. Heaven’s Best offers honest prices and honest expectations. Our rates are very reasonable and we do not tack on extra charges for cleaner or deodorizer. Call Heaven’s Best today at (205) 618-9150 to schedule a thorough low-moisture carpet cleaning in Birmingham, AL. We will thoroughly clean your carpet at a great rate, and it will be dry in about 1 hour, so you can get back to your normal activities in no time.